UAH Global Temperature Report: April 2014 – still no significant change in temperature | Watts Up With That? Global composite temp. : +0.19 C (about 0.34 degrees Fahrenheit) above 30-year average for April. Northern Hemisphere: +0.36 C (about 0.65 degrees Fahrenheit) above 30-year average for April. Southern Hemisphere: +0.02 C (about 0.04 degrees Fahrenheit) above 30-year average for April. Tropics: +0.09 C (about 0.16 degrees Fahrenheit) above 30-year average for April. Compared to seasonal norms, the coldest place in Earth’s atmosphere in April was over the western Antarctic by the Ross Ice Shelf, where temperatures were as much as 3.32 C (about 6.0 degrees Fahrenheit) cooler than seasonal norms, according to Dr. John Christy, a professor of atmospheric science and director of the Earth System Science Center at The University of Alabama in Huntsville. Compared to seasonal norms, the warmest departure from average in April was in southeastern Russia near the town of Chita. Temperatures there were as much as 5.69 C (about 10.3 degrees Fahrenheit) warmer than seasonal norms. May 6, 2014 in Climate data. Nature refuses to play ball. Now they are in a panic due to reports like this herein above. So they trot out hacks like John Podesta to shill the lie for them. The billionairs who say Obama must go full bore on Climate Change or they will not fork over the $100 million they promise to the Democrats. So they panic, yet this never ending cry of “wolf climate coming” now falls on tired ears. Al Roaker is to croke it out on a TV interview with the know nothing President on DateLie NBC tonight is one more example of how desperate they are becoming. Keep up the fact attacks. They have no defense other than newold lies. I see a fairly well-defined sine wave in that graph – is it just me? Isn’t it trending back toward the “0.0” axis since about 2010? What would count as a significant change in temperature? A response to the El Nino that’s brewing. It does appear that UAH temps respond well to ENSO events. The map is distorted, but good news is that Himalaya glaciers seem to be safe. However 500,002 sq mi of Gobi desert seems to risk boiling over. Never mind the natural seasonal variation from -40°F to 122°F and 24 hour variation can shift within 63°F. It’s our fault, right? you are mistaking ANOMALIES for temperature. Next, these are temperature anomalies for the atmosphere 8 km UP. If you want to check the diurnal ranges at that altitude and seasonsal ranges you will need to use a different sat product. RSS could be used for seasonal, AIRS for Diurnal. Do you guys ever look at data and its documentation? 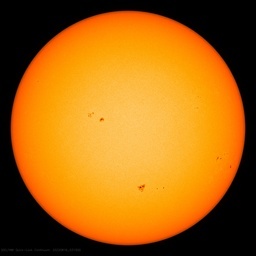 Bob Tisdale says May 6, 2014 at 12:37 pm – But it’s still right on the verge of it. UAH for April for version 5.6 went up from 0.170 in March to 0.190 in April. If I assume version 5.5 will also go up by 0.02, then the 4 month average becomes 0.165. If it were to stay at 0.165, 2014 would rank 10th. The time for a slope of 0 would be at least 9 years and 8 months for version 5.5, but it could go back further. RSS for April came out at 0.251. That makes the 4 month average 0.222 and tied for 9th place. The length of time for a slope of 0 increases to 17 years and 9 months. Nature does its own thing, refuses to comply with the IPCC models. But suddenly we have discovered that climate changes. It changes due to humans and that is bad. It never changed before humans started producing CO2. Oh for the good old days when we lived in trees and caves with the monkeys and bears. Temperatures this month are the same as they were 1996, 1991, and 1988…. And substantially cooler than they were in 1998! 8<) Ain't good science, but makes a good sound-bite. We should start a petition preventing Dr. John Christy from ever retiring. Is that how you understood it? In my area of expertise anomalies and variations aren’t synonyms. Si vous pouvez me tutoyer, ça me fera plaisir ≈ no need to address me formally in plural form. In my experience ‘anomaly’ means observers have to verify the raw data to find the truth. However tempting, I’m not planning a trip to Gobi desert to check how that’s obtained. Thanks for the message, Brother Bob: And what do El Ninos cause? (Chorus everybody) GLOBAL WARMING!! Mosher @ 1:02 pm scolds Jaako. Nevermind that there is a huge “hot spot” over the Gobi that indicates it is running a high anomaly… nope, Mosher has to make sure to put Jaako in his/her place. Big picture: Man is responsible for 100% of the suffering endured worldwide by rocks and trees and sundry “innocent” creatures, so the honorable thing for Man to do is commit suicide to Save the Planet. Well it does say layer= lower troposphere, not tropopause, so to an eejit like me that would mean all that’s from the ground up to about 2km. If it’s any different you might want to edit wiki. I don’t understand why, if the warmista are so concerned about their future generations, that they just stop breeding them. Problem solved. WaPo propaganda on full display! Correction: An earlier version of this article incorrectly stated that the Koch brothers, Charles and David, founded the Cato Institute. Charles Koch was a co-founder; his brother was not. This version has been corrected. Other contrarians include libertarians at the Cato Institute, co-founded by Charles Koch, one of two brothers whose multibillion-dollar fortune is partly derived from fossil fuels, and are well-known to deny the impacts of climate change. I love the long break in the warming trend, but natural factors are sure to reverse and create another warming cycle. When it does, I hope that public statements will have noted the trend in advance. Warmist deviants will doubtless spin this every which-way. Let ’em. Steven Mosher says: “Next, these are temperature anomalies for the atmosphere 8 km UP. Lower troposphere temperatures are from the surface to about 12.5 km, but weighted to the lower 3 km. “Vattenfall will discontinue its R&D (research and development) activities regarding coal power with CCS (carbon capture and storage),” the group said in a statement explaining its new research plans. Capturing and liquifying CO2 coming from carbon combustion to later store it underground was meant to curb greenhouse effect gas emissions, but its costs and the energy it requires make the technology unviable. These difficulties had already forced Vattenfall to give up in 2011 a large project at a pilot plant in Jaenschwalde, in eastern Germany. The European Union then demanded the reimbursement of funding worth 45 million euros ($62.75 million), but neither Vattenfall nor the EU ever said whether the group complied with the request. In late 2011, the Swedish company said it still believed in the project and stated that it expected to build a coal power plant equipped with CCS by 2025. The PDO has been positive for the 1st 3 months of 2014. The negative trend on this dataset goes back only to August 2008 (5 years 8 months). Anthony – don’t expect a call! PHOTO CAPTION: Barack Obama wipes sweat off his face as he unveils his plan on climate change, June 2013, at Georgetown University in Washington, DC. Barack Obama has signed up for eight interviews with TV meteorologists on Tuesday to defend a landmark report against those who deny climate change. TV weather forecasters remain among the most trusted sources, according to opinion polls. Some 89% of Americans rely on local television for their weather news, according to a 2012 report from the Pew research centre. The same report said 62% of Americans trust television weather reporters on climate change far more than they do climate scientists. The problem is, however, that there is a strong current of climate scepticism among weather forecasters. Some of the most prominent television meteorologists deny a human cause in climate change – or insist there is no evidence of climate change. Meanwhile, the campaign group Forecast the Facts complained that broadcast meteorologists do not do enough to explain how climate change is contributing to heatwaves, drought, and other extreme weather events. The meteorologists interviewing Obama on Tuesday include: Al Roker, co-anchor of NBC’s Today Show; Ginger Zee, meteorologist on ABC’s Good Morning America; John Morales, chief meteorologist of NBC 6 in Miami, Florida, and Jim Gandy, meteorologist of WLTX-TV in Columbia, South Carolina. It is pointless to look for “records” in smoothed out data. EPA has had a intermal Home Land Security operation, operated by White House people who will be asked questions by House Committee tomorrow. Well I always get giddy when I see these various and sundry “lower troposphere” Temperature Anomaly reports. I understand how the sun heats the surface, whether ground or ocean. I live on the surface (ground not ocean) All the trees and plants and animals live on the ground or close to it. And I’ve seen some of those boxes alongside the Weber grills, for recording the official “surface Temperatures”. I assume that they record Temperatures in the usual scientific SI units. Presumably, somebody else, somewhere else converts these temperatures into “anomalies”. I understand how conduction, convection and evaporation, which are macroscopic thermodynamic processes, “heat” (verb) the lowest atmosphere, and add moisture to it, transporting “heat” energy (noun) and moisture to the upper layers of the atmosphere, where it is normally both lower temperature, and lower pressure and density. I understand that the second law of thermodynamics says that this hot to cold direction is the normal direction of net heat energy flow, and unaided, it will not (net) flow the other way. I understand how these processes warm the upper atmosphere up to much higher altitudes than I live (or the trees). Finally, I understand how the warmer solid and liquid surfaces radiate thermal LWIR electromagnetic radiation energy similar to ideal black body thermal radiation; but with less than unity total emissivity, which cools the surface, And I understand how select portions of this radiation spectrum are captured by various so-called green house gases, and hence warm the lower and upper atmosphere through molecular collisions, and I understand how visible moisture clouds absorb significant portions of this LWIR radiant energy that they intercept., thus delaying the otherwise prompt ( 1 msec.) escape to space of that energy. And I understand how during daylight hours, that delayed escape allows additional solar energy to arrive, and that offset results in an increased surface temperature, over what it would be if the radiant cooling was not delayed. Of course, at night time, there is no incoming solar radiant energy, so the delay in escape of the cooling LWIR radiant energy does not result in any temperature offset; it still cools down; just takes longer to make the exit; maybe even a few seconds, instead of a millisecond. But for the life of me, I don’t understand why I should care what the atmospheric temperature is at 8 km above the surface, since everything lives on the surface; or within a few meters of it. We measure with thermometers what it is at around sixty inches, or maybe it’s two meters above the ground on a pole. So why don’t the satellite thermometers just read the temperature at two meters, just like the pole thermometers ?? That’s where the CO2 is densest anyway. I haven’t watched the evening news in years, but tonight, as I ate dinner in Laramie awaiting a final exam, I watched Brian Williams. My god. It is worse than I thought. Williams has that constant look that is a cross between pained sincerity and smug sanctimony, while his minions in the fields recited a list of weather phenomena–tornadoes, fires, floods, drought and scorching heat, and on ad nauseum. I wanted to ask Brian, personally, what about the tornadoes, floods, and so forth? For him, It is as if merely repeating this list over and over is enough to convey the gravity of the situation. This is where we have arrived. No-nothings repeat lines written for them on a teleprompter–politicians, actors, and newspeople–the priesthood of a strange new tribe. Still pretending we measured the GTA in 1938 sufficiently to claim the GTA in ’98 was higher? If so you’re a whore, not a scientist – and that’s a fact – deal with it. Just reading Mosher’s comments; don’t you see why we can only trust the satellite temperature measurements. BEST, NCDC, GISS have no objectivity that would cause us to have trust in the surface records produced by these organizations. I mean let’s say Mosher is completely wrong about the global warming theory. I mean 95% or completely wrong. And then he has to be the one to actually prove just how wrong he is through the data he/BEST is producing. I don’t see it happening. After RSS May 2014 release, the latest 9 years on that record is no longer the warmest (unless I made a mistake). What does it mean? Probably nothing much, but some parties (Met Office?) have been pointing at decadal averages as a disproof of the pause. That “disproof” now seems to rely on an arbitrary selection of time period and dataset. When your seeking dis-information the temp up at eight kilometers might just help fudge for the cause. Like the robin that did it for a lark? Well it’s up, however minimally, and it’s been up more than down since 1997, however minimally, which is totally different from the last midpoint of a PDO nina phase when dT actually DROPPED. Since for all we have learned and all the dizzying information at our fingertips, we remain naked apes staring into the sunrise, I offer here the Dud PDO index of climate sensitivity. In 1962, the current analogue of the last nina phase, temperatures had dropped from d.1 in 1945 to d.04 in 1962, for a drop of .07C, delta on delta. We take the difference of atmospheric CO2 from Hawaii, 334ppm in1976 (the PDO transition year) to 400 today for an increase of 66ppm. 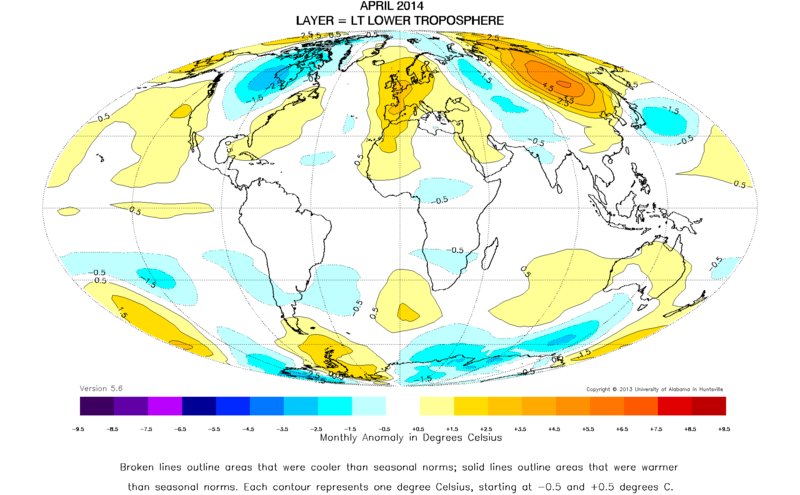 Given that the climate models predict the surface should warm at a lower rate than the troposphere, why don’t the climate scientists stop using the surface temperature records – with all their sparse data problems, kriging infills and complicated homogeneity adjustments – and instead simply infer the surface temperature (anomaly) from the satellites? Or plunge us back into a little ice age or indeed a full one. The only thing I am sure of is that if sure bets were the order of the day gamblers would be rich and betting shops would not make money. I know an El Nino is supposedly in the works but the graph has an obvious sin wave that shows we should be bottoming out in 2015 or 2016. You may think it’s pointless to look for records in smoothed data, but there are plenty of them about. Whenever you see comments such as “warmest month”, “coldest spring”, “hottest decade”, etc., isn’t that exactly what you’re looking at? They are averages of the much smaller daily (or perhaps hourly) parts. Alittle high. Observer at Hagerstown, MD shows -1.7 F (-.8 C) for April. Satellite shows -.5 to +.5 C.
Hi George, it’s a case of S & C realizing that they could use the existing microwave scanning instruments onboard satellites to infer temperature, by using different channels they were able to readout at different altitudes, not possible to resolve the 2m temperature. The original problem that they had was due to overlap between the troposphere and the stratosphere which they had to correct for. Christopher Monckton, would you “do that thing” where you start with the current temperature, and calculate backwards as far as you can go while the slope remains zero? If you want UAH version 5.6, click UAH. Click the blue ball to the right until the blue ball is at April 2014. Click until the red ball is at August 2008. But at July the slope is positive. So the slope is assumed to be 0 from August. Note that the April number may not be up yet. As well, when a new number comes in, go by the last month you have such as August 2008 and depending on whether the new point is above or below the zero trend line, use trial and error month by month to get the new time for a slope that is at least slightly negative. Thanks for the news, I’ll be updating my article on the UAH Global Temperature Report. You can download the figures from the dataset and work out the trends for yourself. Including April’s data, the trend is -0.019 deg C / decade since August 2008, and positive since all dates earlier than that. So, Steven, What are the temperatures 8 km up? That would be above 24,000 feet. I would point out: TEMPS NEG ABV 24000. translation: Temps negative above 24,000 ft.
@24,000 ft the temp is -41 C.
So the Temp adjusted (love that word) up by 0.17 is (drum roll) -40.83 C. I feel warmer already. This is the problem with using anomalies instead of real temperatures. No Context. Bob Tisdale May 6, 2014 at 4:05 pm. So, is the PDO still in its negative phase? Or can we expect the pre-’99 warming to resume? The negative PDO index has persisted near 4 years (47 months) since May 2010, and weakened significantly in Mar 2014 with PDO index =-0.02. I recall some website that shows the temperature readings from each of the commonly-used global indexes: Hadcrut4, GISS, NCDC and draws a graph for you with a trend line for the time period you select. But I can’t find it. Does anyone have the link? Yes, thank you so much, Werner.